Back in May, real estate tycoon Tim Gurner took a jab at millennials suggesting that they’re unable to buy homes because they buy too much fair-trade coffee and avocado toast instead. Needless to say, that’s not true. 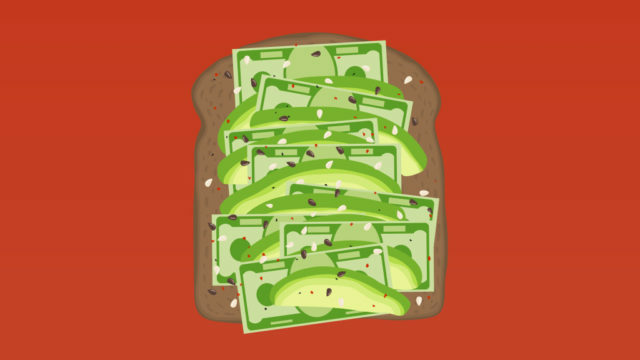 An avocado toast calculator (yes, it exists) revealed that it would take almost 5,000 orders of the West Coast breakfast specialty to purchase a median-valued home in the United States, which is insane, if not impossible (that’s 13 orders a day for a year). So if it isn’t trendy foods keeping millennials from purchasing their first homes, what is? The answer would be student loan debt. Millennials are delaying their first home purchase by seven years due to these debts, according to a new study from the National Association of Realtors and American Student Assistance. Traditionally, Americans purchase their first home in their early thirties, but the survey of more than 2,200 student loan borrowers reveals Americans have to wait almost a decade because of student loans. The survey revealed eight out of 10 property virgins blame these debts for delaying the purchase of their first home. Oddly, this figure was higher among older millennials (born between 1980 and 1989), though students who borrowed more than $70,000 were most afflicted. Researchers assert this effects students hoping to purchase their secondhome by as many as three years. Student debt has made it impossible for young adults to save, 85 percent of the sample claims. Almost three-quarters said this debt makes them too insecure to even try purchasing a home, as more than half can’t qualify for a mortgage due to their debt-to-income ratio. Considering today’s student loan debt is $1.4 trillion–a figure that has more than tripled in the past two decades–this doesn’t come as a shock. Nor does the fact that four in 10 millennials have delayed moving out until after college and 32 percent confessing they still live with mom and dad. While research has suspiciously found young people with college debt are actuallymore likely to own a home than those without loans, student debt affects decisions removed from real estate as well. For instance, six in 10 respondents can’t afford to contribute to a retirement account, causing 32 percent to contribute a reduced amount. Student debt also affects the ability to take a vacation (72 percent), to purchase a car (65 percent) and to continue with their education (64 percent). It doesn’t help that millennials earn paltry incomes, either. Data provided by Business Insider determined that, outside of the nation’s capital, the median income for millennials doesn’t exceed $26,000. For context, the median income in the 1980s was $40,560. But there is good news. According to the New York Post, the gender wage gap is closing in a number of states. States with the smallest gaps were New York, California and Florida–so go ahead, pat yourselves on the back. On the other end, states like Louisiana, Utah and West Virginia possessed the largest gaps. Thankfully, the article notes that policymakers are beginning to take the issue more seriously. For example, Massachusetts, Utah and California have each passed legislation to combat gender pay biases which will help identify companies with discriminatory pay and challenge those practices. But while the gender wage gap is narrowing, it isn’t closing near quick enough. At its current pace, women won’t earn equal pay until 2119, according to the American Association of University Women. However, the Institute for Women’s Policy Research offered a far more generous prediction, estimating it will take 65 years. While the latter figure is certainly better, it still means a woman born today wouldn’t see equal pay in her working life.